Alright, so today’s woman isn’t an unknown feminist. In fact, she’s probably one of the most well-known feminists in history. But she’s always worth a closer look, in my opinion. Things got a little behind so here’s a few women in one post for you! First, the Notorious RBG. Ruth Bader Ginsberg has moved women forward legally for decades. She saw the long-game from the start. I highly suggest the recent documentary about her, RBG. Of course, there are a thousand other places to find info about this incredible woman, but it’s just a really good film. Next, let’s stick with the SCOTUS thing. Judge Sonia Sotomayer was the first latina judge appointed to the Supreme Court. Read more about her. Frida Kahlo is always worth a look. I can’t even begin to describe how amazing she is. The most notable thing for me, though, is that all my friends know who Frida Kahlo is. I’m not sure many of them could name her husband, even though when they were alive he was the celebrity, and she was seen as his “little wife” who dabbled in art. 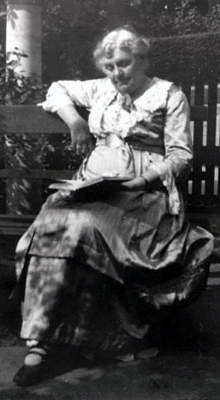 Jovita Idar was a journalist, a Mexican-American activist and supporter of women’s rights. Lilian Bland was the first woman to design and build an airplane and she’s pretty amazing! Alright, hope that was a good makeup for the few days I took off. Who are you learning about this month? Today is International Women’s Day and today I want to focus on a living woman who is doing amazing things for women. Recently she signed an open letter supporting transfolks. She backed out on a movie becaues she wouldn’t work with Lasseter. She’s doing a lot today for women and showing her cards as an ally on a regular basis. She’s pretty awesome. Celebrate yourself today, too! Happy International Women’s Day! How about an environmentalist? I’d like you all to meet Anna Botsford Comstock. Two for one day. Somehow I forgot to publish yesterday’s post. First up, another pirate. Okay, so I have a thing for pirates... and nautical history. I read a lot about shipwrecks. It’s a thing. Second today, Margaret Brown. The Unsinkable Molly Brown, if we want to stick with that nautical theme. Seriously, she was on the Titanic. Go check her out. She’s been one of my favorite historical figures basically since I heard Debbie Reynold’s sing “Belly Up to the Bar Boys” when I was very small.